Technology kept collapsing around us last week, despite my hopes for a turnaround in luck. The refrigerator dropped back to its prior level of weak performance, managing to keep the interior only about 46 degrees on electric and about 50 degrees on propane. 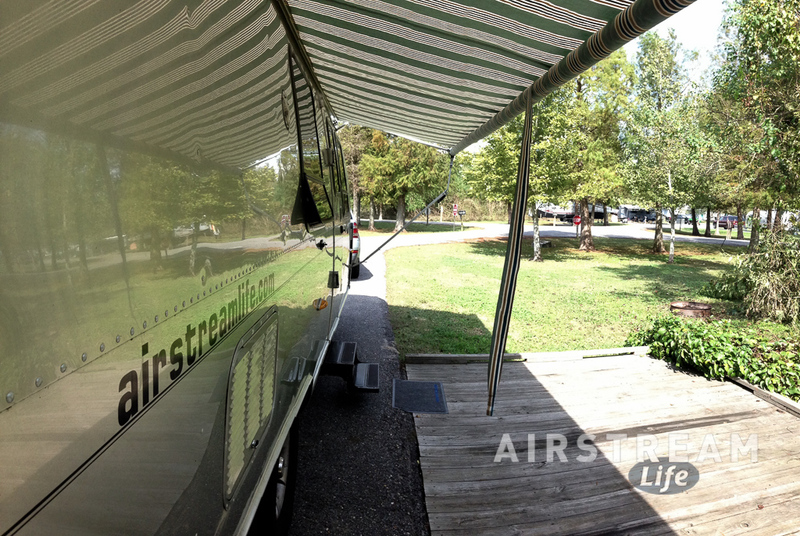 In addition to everything else that went wonky, the rear-view cam on the Airstream went dark as we left Destin FL, and so it made sense to drop in on our friends at Airstream of Mississippi (Gulfport, MS, right off I-10) for a little help. 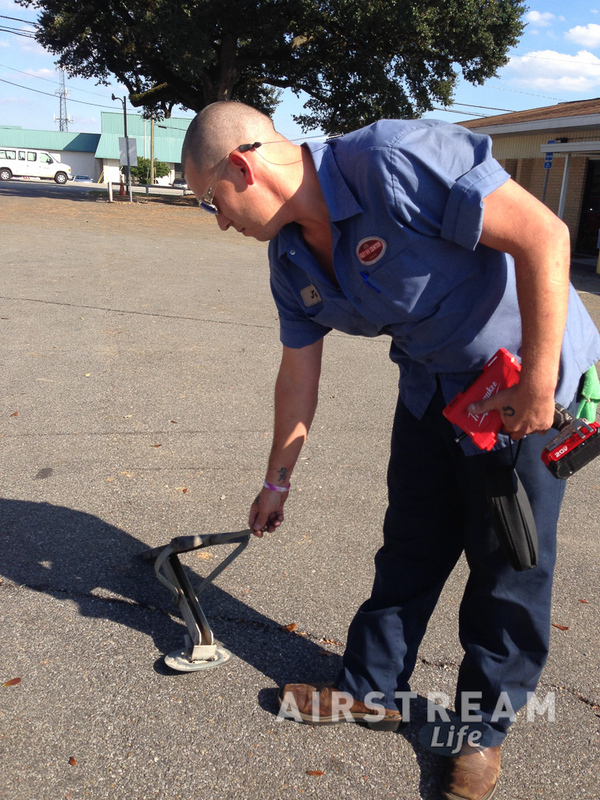 AS of MS (also known as Foley RV) has a small but capable service department. Jesse (pictured here) swapped out the bent stabilizer in a few minutes, which I appreciated particularly because it meant I didn’t have to lie on my back and wrestle it off with my own wrenches. The service guys were kind enough to take a good stabilizer off a used Airstream, since they didn’t currently have a new stabilizer in inventory. That’s good service! They also took a look at the mysterious failure of the rear-view cam and figured out in a few minutes that the problem was in the flexible cable that carries the signal from the Airstream to the car. A little tweaking and that problem was solved too. I was starting to have hope. 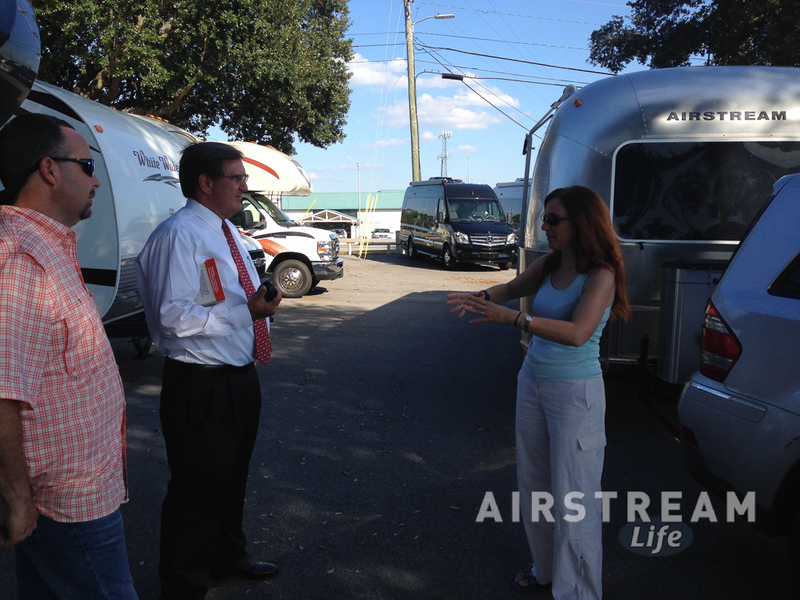 I should pause here to say that Rick Foley and his team are really great—making Airstream of Mississippi one of my favorite dealerships to visit. Rick is a “real Airstreamer.” He actually became an Airstream dealer after being a vintage Airstream owner and falling in love with the lifestyle. That’s good motivation by my standards. Rick has a nice Argosy motorhome these days, which is looking sweet thanks to a recent repaint in the neighboring bodyshop. At that point we still thought the refrigerator was working, so I didn’t ask about that, but later that day when we pulled into Bayou Segnette State Park in Westwego LA (across the river from New Orleans), it was obvious that we still had a cooling problem. Since we’d already reduced our perishables to a bare minimum, the weakness of the refrigerator wasn’t as much of a crisis as before. We left it running in hopes it might recover, and spent a day in New Orleans with our good friends Lexie and Charon, visiting a few old favorite places. I had to get a really good muffaletta, for one thing, and so we had lunch at a place I’ve been visiting for muffalettas since 1983. In my college years I visited Cafe Du Monde many times, but never before midnight. It was something of a ritual back then, topping off an evening of wandering and listening to jazz leaking out of the cafes and restaurants, with an order of 3 beignets and coffee. Being a tad older these days, we hit it in the mid-afternoon this time. It was exactly as it always is: simple, crowded, and fun. 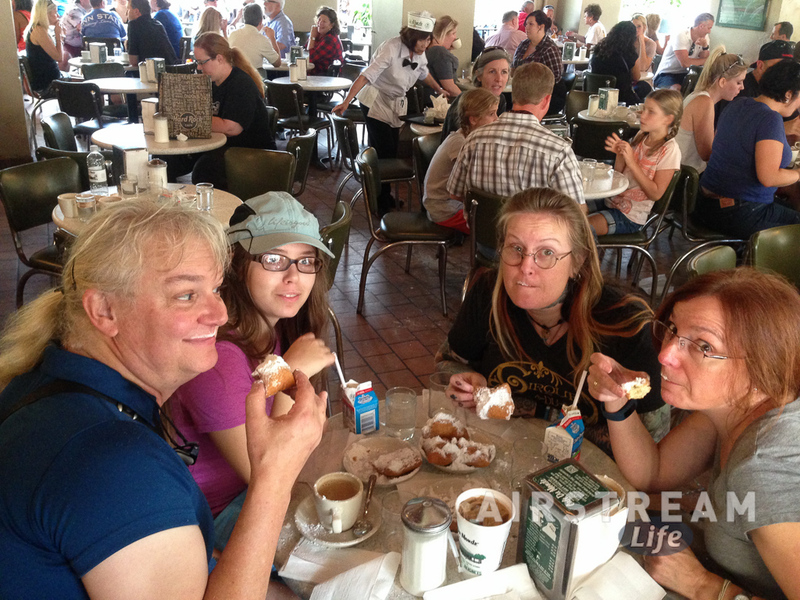 Wearing powdered sugar from the beignets is de rigeur. I had left a few white smudges on my green Airstream Life baseball cap as a souvenir until the heavy rains over the weekend washed them off. We had only one good weather day out of three this visit, so we made the most of it, walking all around the French Quarter and riding the St Charles streetcar its full length at sunset. Everyone was out in their Halloween costumes a day early because of the strong forecast of rain on Halloween, and this made the people-watching just fantastic. New Orleans is a city of drama and costume already, so when you mix in Halloween and massive parties along St Charles and Carrollton, it’s a virtual show. The next day I tackled what technical problems I could, with Lexie’s help. I’d had several packages sent to the park, so at this point I was able to replace the dead Wilson cellular booster, replace the failing showerhead and flexible hose with an Oxygenics model, and replace the TPMS with the latest version with user-replaceable batteries (this is the same one I sell in the Airstream Life Store). I also lubed the awning arms with silicone spray since they were sticking. I felt like I was making progress against entropy. The big project was the fridge. First, I wanted to make sure that the propane gas pressure was set correctly at the regulator. Low pressure can cause the refrigerator to fail when running on gas. Lexie had an old-fashioned blood pressure manometer that read millimeters (mm) of mercury (HG). In the photo at right you can see our almost steampunk-appearing test rig. 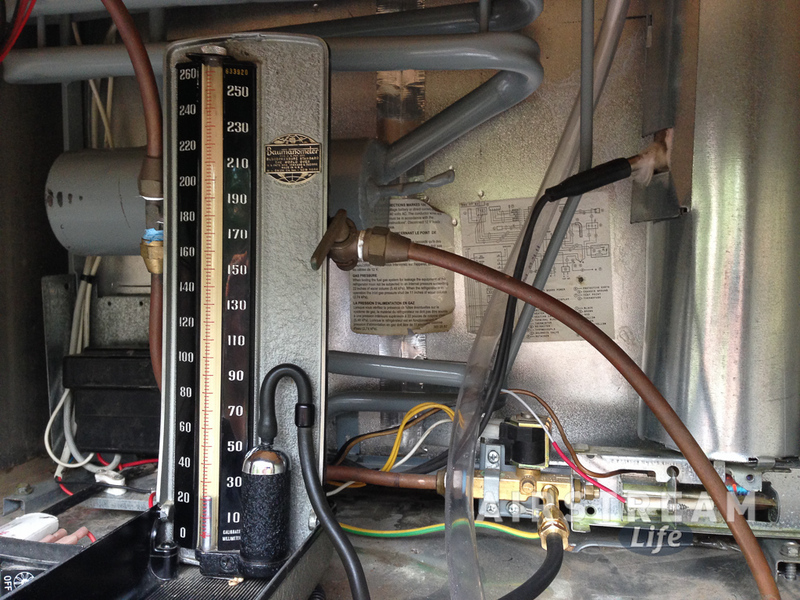 We bought a few pieces of brass at the local hardware store to screw into the test port on the refrigerator (1/8″ FIP by the way) and connected the rubber hose from the blood pressure gauge to that. I decided to do the test that Arcticold requested. This involved disconnecting the 120 volt wires to the refrigerator’s circuit board, and cutting/splicing them to connect the electric heating element directly. Essentially this “hotwires” the heater so it runs full bore even if the refrigerator is turned off. This test eliminates any possibility of failure caused by a faulty circuit board, thermistor, or gas burner. After 24 hours of running like this it was clear the cooling unit wasn’t performing. The fridge stayed in the upper 40s. We let it run like this for another 12 hours, taking temperatures of the exterior tubing periodically with an infrared thermometer so I could report to Arcticold. On Sunday I re-wired it back to original–with one exception. Now it has a set of “quick disconnect” plugs so that I can easily repeat this test without cutting anything. I gave Arcticold a call this morning and got voicemail again, which I expected. They didn’t call back today, so it looks like this could be a long slog. Meanwhile, we’re back to putting dry ice in the freezer to protect the few things remaining in there. Despite not having reliable refrigeration, Eleanor is still managing to cook well. 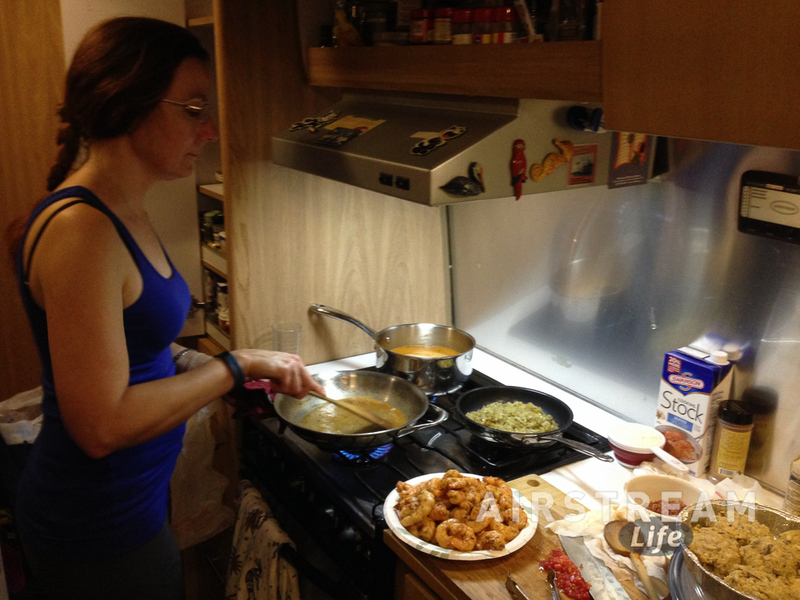 In the photo above she’s making a spectacular meal of South Carolina’s famous “Shrimp & Grits” with a few crabcakes on the side. She has adopted a philosophy of buying fresh stuff daily as we need it, and using the refrigerator mostly as a moderately cool place to store less perishable things like canned drinks and butter. We’re also making a few substitutions like buying UHT milk. It turns out that refrigeration is overrated, and by the end of this trip we may have figured out that we don’t need it at all. After all, Wally Byam toured Europe in 1948 without a refrigerator. I think we can get across Texas and the desert southwest. Rich, it looks like my advice to not trust the fridge was accurate. Maybe it was possessed in honor of Halloween, though I doubt it. It’s good to see you were able to cobble together a manometer to check the pressures with, we’ll have to work on getting you a real one, for “next time” (not pointing at ANYTHING). Thanks for stopping by to say hello. As always, it was great to see you & your family again!